Beaker the Cherryheaded conure came to us the way all of our pets and three of our children did...somebody else didn't want him. A friend had purchased him for his son, who didn't want to spend the time to socialize Beaker, and by the time we adopted him at age 1 ½, the only words he knew were, "Shut up!" It was three months before I could touch him. But, by the time he'd been with us for 6 months, he was the original velcro bird wanted to sit on my shoulder at all times, play with my beard, groom my hair all that lovey stuff. He'd also learned a fairly large vocabulary, and would tell me "goodbye" whe I left in the morning and ask to be picked up when I came home in the afternoon. He was my buddy. One night in September of 1999 we put him and his pal Cosmo the Patagonian to bed as usual, and everyone was perfectly fine. The next morning, a Sunday, Beaker was lying on the floor of his cage, unable to sit up. His feet were tightly clenched, and he couldn't extend his legs at all. He could barely hold up his head, in fact. We'd never had birds until we got Beaker, and had no idea what this could be. The avian vet met us and opened her clinic at noon on Sunday, and began a series of exams and tests. Xrays negative. No lesions or injuries. Nothing observable by palpation. No egg-binding. While we awaited for the results of the blood work, we started chelation therapy, in case it was metal poisoning, and began a course of antibiotics. We all thought he would dieme, my wife, the vet. Every minute that I wasn't at work, I held him in my hand, stroking him, helping him eat. I'm a six foot-two, two-hundred-twenty-five pound ex-Marine. I'd have never imagined that I would find myself crying over a birdbut there I was. I was sick with fear for him. For the next month, Beaker was in every day at the vet. A few times early on he spent the night. We never did find out what the trouble was. Tests for metal poisoning were negative, and no other anamolies showed in his blood work. The vet contacted other vets, all over the country, and tried everything they suggested. Nothing showed up. Best guess seems to be a spinal cord injury from a fall in the cage at night. We had to make a padded box for him to live in, since he was unable to stand. All he could do was crouch with his legs under him. He grew sores on his hocks from the abrasion, so we went to softer cloth in the box, and treated the sores with antibiotics as well. After several weeks, he began to be able to partly stand, and could open and partly close his toes. I started to do stretching exercises with himevery morning and evening he would lie on his back in my hand, while I gently pulled each leg to full extension, then returned it, maybe twenty repetitions. He seemed to like the feeling. He'd lie there and say "ahhh, ahhh", and scrunch his eyes up. After about 6 weeks, he could walk pretty well. 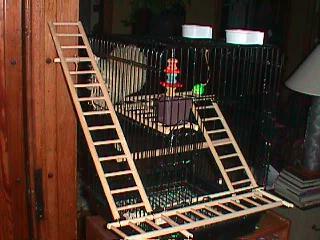 But he obviously couldn't climb the bars of his cage, to get from perch to perch, or to feeders, or up the outside to get to his roof. In fact, he couldn't grip a perch well enough to sit on it. 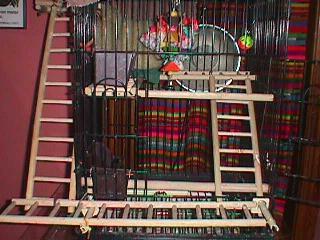 So I used wooden birdy ladders to make ramps and platforms that he could climb and sit on without having to grip too tightlya handicapped-accessible cage. We put scraps of sheepskin in his favorite corner for him to snuggle at night. He gained back his weight, and walked. He flew from cage to my shoulder, and back. Sometimes he'd fall asleep lying on his back in my hand while I typed on the computer. Even disabled, he had a quality of life that we could live with, and was a happy bird. But he continues to surprise us. On a day in the following April, he walked across a perch and climbed, with difficulty, along a side of the cage. In June, he climbed straight up the door from the inside. And in August, he did the up the cage and over the top trick, for the first time since in a year. We cheered every step. Since that time he's continued to improve, and our vet is amazed at the recovery he's made. Recently I decided to attempt an experiment; every other bird in the house has a small "tree" attached to their cage as a play gym. Beaker hasn't had one, since he couldn't climb or perch. But, I cut one, specially designed for the limits he still has, including the fact that he hasn't actually perched since September of '99. Close to the cage roof, level, short distances between branches. I attached it to the cage, and set him on it, so he could try it outhe wobbled, stabilized, then climbed down and walked away. I thought, well, he'll take some time to get used to it, then maybe he'll try climbing it on his own. An hour later, I walked back into the room, and there sat Beaker, on the top branch (all of 9" above his cage) looking like he'd been there every day this year! This was the first time in nearly two years that he'd voluntarily gone up a branch, or perched on anything other than a ladder or platform. Now I can start using branches of different sizes, climbing structures, really begin to rehab his muscles. So, what's the point? Simple...our birds are a lot more resilient than we give them credit for sometimes. Yes, Beaker took a lot of vet visits, and a lot of stretching exercises, and a lot of adaptation but the recovery he did on his own.